Glens Falls Water Treatment Plant - Glens Falls, N.Y. The City of Glens Falls contracted with Jett Industries, Inc. to provide Design/Build services to the City for construction of their water filtration plant. This project was the first design/build contract for a municipality in the State of New York. Jett Industries sub-consultant for engineering services was Delaware Engineering PC. 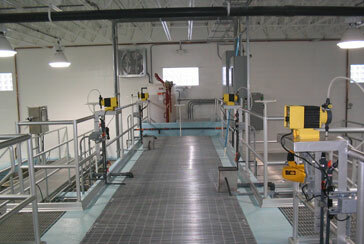 The scope of work included construction for the average daily usage of 4.5 MGD using the Dualsand™ sand filtration technology, including a chemical feed system for coagulation and disinfection, a masonry block structure to house all process related equipment and administrative offices and laboratory. The instrumentation package was for full plant automation and SCADA system. Site work included a site lift station and force main for reject water to be conveyed to gravity sewer. Contract included replacement of the City’s raw water pumps at the Halfway Brook Reservoir pumping station. This $6 Millon project was a fixed costs and included separate prime bid packages for electrical and HVAC work as governed by NYS general bidding practices. C&F Fabricators provided all miscellaneous metals for grating, handrailing, access stairways, pipe supports and stainless steel piping.